As part of Jordan Brand’s offering as part of the USA’s celebration of its Independence Day, two new USA-themed sneakers were released on the 4th of July, the Air Jordan 5 Retro and the Jordan CMFT Viz Air 13. The “Independence Day” edition of the Jordan CMFT Viz Air 13 was released in White/Varsity Red-Obsidian colourway, which looks similar with the edition of the Air Jordan Retro 5. If you want to get a feel of this rare release from Jordan Brand, don’t think twice now and grab one immediately. Another Jordan CMFT Viz Air 13 Now Available! 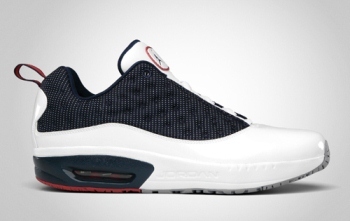 A Jordan CMFT Viz Air 13 LTR Coming This June!